The Charity Ball has a new name: Snowcoming. Over the past month, the WBHS Student Council made decisions to modify the annual Charity Week, to encourage more students to participate. Only 300 students attended the Charity Ball last year. Starting Feb. 22, Snowcoming Week will include dress up days (displayed around the school) that correlate with the charity the West Bend High Schools are supporting each day. Participating in these dress up days will show support for the Nathan & Esther Pelz Holocaust Education Resource Center; Homes for Our Troops; the Youth and Family Project; Movement and Action for Benefit Orphans; MACC Fund; and JDRF, which funds diabetes research. The week will end with a Hollywood-themed dance Saturday night in the fieldhouse. “I am excited about the cancer charity were donating to because I’ve had family members pass of cancer. It’s always good to give back to the research and to be able to progress in finding a cure for cancer,” said Kellie Armistead, Student Council member. During the last half hour of the school day Friday, a pep rally with check presentations, competitions, games, the drum line, and an athletic parade is planned. “The dance teams will be dancing, we will highlight the charities, and we will potentially have an activity to include students and teachers,” said Kelly Dufner, Student Council co-adviser. Saturday’s dance begins at 8 p.m. 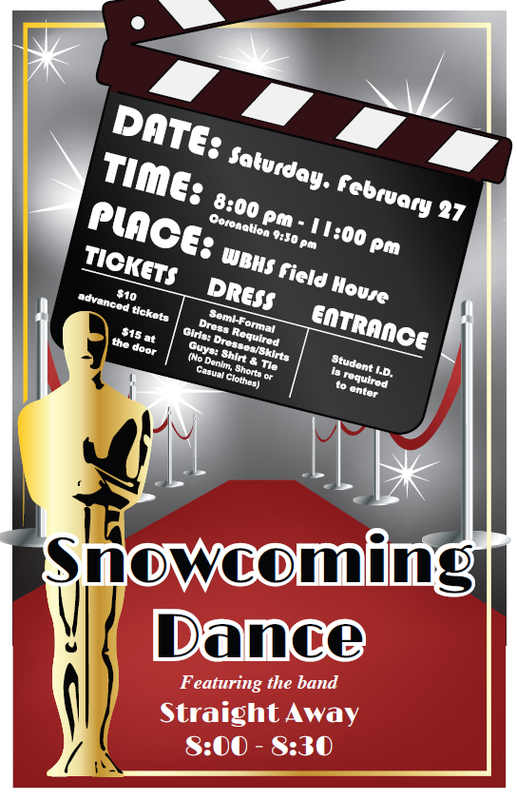 Going to the Snowcoming dance “is a great way to support the JDRF foundation and a really easy way for students to be able to support charities as well as have a lot of fun,” said Alysia Santamaria, Student Council co-president. The band Straight Away will play from 8 p.m. to 8:30 p.m., and then the same DJ from homecoming will return to play music until 11 p.m.. Tickets are $10 if bought in advance and $15 at the door. The Snowcoming dance is semi-formal, but buying a new outfit isn’t necessary if you’d rather save for prom. Trading or sharing clothes is a smart cost-cutting option. A dress, a skirt and a nice top, or slacks and a shirt, are all acceptable clothing options. Jeans will not be permitted. “I am going to get a huge group of friends and we’re gonna go have some fun with our last year going!,” West senior Emma Loeffelad said.